SSTL of Ukraine – one of the main libraries of the country with unique multi-sector holding of scientific-technical literature and documentation, which contains almost 21 million samples of documentary information sources. The Library holding covers: the largest patent documents holding in Ukraine, unique holdings of industrial and normative-technical documentation, dissertations, reports on Research Development and Engineering (R and D), deposited scientific studies, holding of domestic and foreign books as well as periodic publications of scientific-technical focus area. SSTL Ukraine regularly takes part in international, national and specialized exhibition; productively cooperates with various institutions; conducts presentations; the Library tours; and distributes leaflets, booklets, business cards as well as prints information in the press. Foundation of The State Scientific-Technical Library of Ukraine and all further years of its activity are closely connected with creation and development of scientific-technical potential of the state. Demands of economic situation in the right-side area of Ukraine defined the opening of inter-industry technical library of USSR (Union of the Soviet Socialist Republics) in March 1935 – Kiev branch which was the most advanced among the USSR Narkomtyazhprom State Scientific Library (SSL) branches founded during decade of 1930. 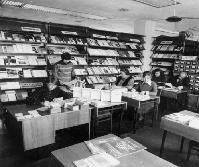 In 1936 the SSL Kiev branch holding included 5 thousand samples of publications and provided services to 10 thousand readers. On the eve of 1941 these indexes already reached 160 thousand of publication samples and 20 thousand readers. The holding and the Library building were ruined during the World War Two. The reconstruction of the Library began in 1945 year. The Library subordination was changed several times until 1958. The Library was granted the State republican scientific-technical library status on the 6 of June 1960 and its current name – in 1992. Should you wish to check out all the electronic assets of the Library and browse e-catalogs, please use section “Electronic assets” at the Library web-site.